Bac-Shield’s active ingredient is Chitosan. Chitin and Chitosan are naturally occurring β-1,4-linked linear polysaccharides. Chitin is essentially a homopolymer of 2-acetamido-2-deoxy-β-D-glucopyranose. Chitosan is the N-deacetylated derivative of Chitin, most of whose glucopyranose residues are 2-2-deoxy-β-D-glucopyranose. Chitin is most commonly derived from crustacean shells, particularly from crabs and shrimp. Commercially, Chitosan is prepared through the deacetylation of Chitin. 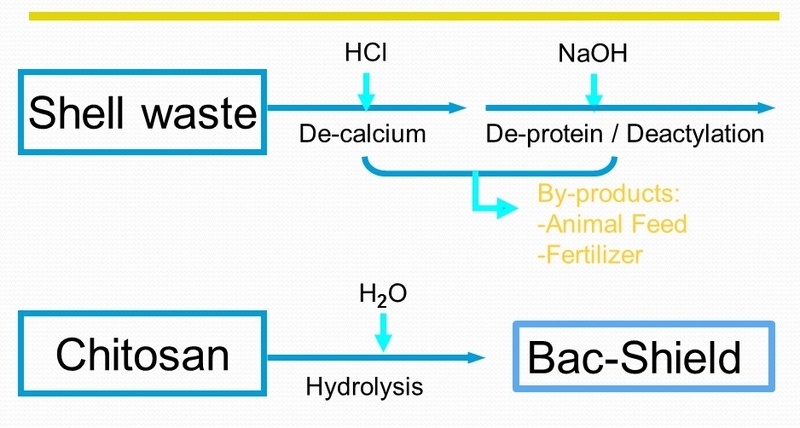 Chitin is extracted by acid treatment to dissolve the calcium carbonate followed by alkaline extraction to dissolve the proteins and by a depigmentation step to obtain a colorless product mainly by removing the astaxantine. Two production chemicals, hydrochloric acid and sodium hydroxide, are neutralized to create “salt water”. A more extensive explanation of the chemical properties and effects of Chitosan is provided in Goy, Rejane C., de Britto, Douglas, and Assis, Odilio B.G. (2009) “A review of the antimicrobial activity of chitosan”, Polímeros 19(3). The relationship between chitosan’s antibacterial activity and the surface characteristics of bacterial cell walls is presented in Chung, Ying-chien et al. (2004) “Relationship between antibacterial activity of chitosan and surface characteristics of cell wall“, Acta Pharmacologica Sinica 25(7) pp. 932-936. A summary of research on the relationship between the physicochemical properties of Chitin and Chitosan and their behaviors is presented in Aranaz et al. (2009) “Functional Characterization of Chitin and Chitosan“, Current Chemical Biology 2009(3). Bac-Shield has been tested using a variety of methods, including AATCC-100, 147 and 174 and ASTM 2149. AATCC Test Method 174-1998 Antimicrobial Activity Assessment of Carpets. Part 1 and Part 2. These tests were run under laboratory conditions against a gram-negative organism and a gram-positive organism. Results during use may be different due to surface and environmental properties. * Helander I, Nurmiaho-Lassila E, Ahvenainen R, Rhoades J, Roller S.(2001) “Chitosan disrupts the barrier properties of the outer membrane of Gram-negative bacteria”, International Journal of Food Microbiology 71 pp.235-44. Liu X, Yun L, Dong Z, Zhi L, Kang D. (2001), “Antibacterial action of chitosan and carboxymethylated chitosan”, Journal of Applied Polymer Science 79(7) pp. 1324-35.